I wrote yesterday about the 85th anniversary of The Lone Ranger radio show first airing on WXYZ here in Detroit; how the character captured imaginations and went from being a simple local radio show to being an international icon. I thought, therefore, that I would take a moment to discuss the possible inspiration for this legend: the life and career of Captain John Reynolds Hughes of the Texas Rangers. In the photo above from 1894, Captain Hughes is seen seated on a stool with a rifle in his hand at the far right. An unknown Mexican prisoner is seen seated at the far left of this photo. 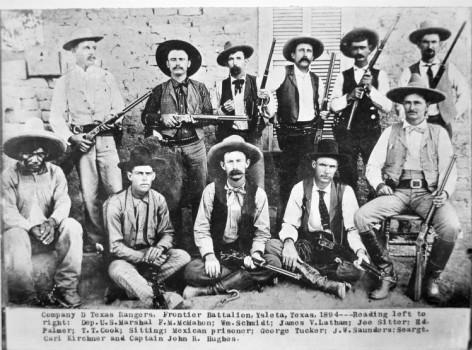 The remaining men in this photograph are the Texas Rangers that Captain Hughes led. Writer Fran Striker and radio producer George W. Trendle never publicly discussed their inspiration for their the Lone Ranger character in great detail. Trendle's obituary in The New York Times stated that he wanted to enliven the Great Depression with a mix of folklore's Robin Hood and pulp fiction's Zorro; the latter of which also rode a horse and wore a black mask. However, over the years, it has been theorized by some historians and authors that Captain Hughes may have played a significant role in inspiring the character. Captain Hughes, of course, was a real-life Texas Ranger who brought law and order to plains from August of 1887 until his retirement in 1915. Novelist Zane Grey dedicated his book The Lone Star Ranger to Hughes in 1914. More importantly, Hughes led an investigation into an ambush on a group of Rangers in 1893 that was very similar to the one depicted in the Lone Ranger's origin story. Hughes also reportedly told relatives that he believed the character of the Lone Ranger was inspired, at least in part, by him. In 1940, Captain Hughes became the first recipient of the Certificate of Valor. He was also inducted into the Texas Rangers Hall of Fame. He passed away on June 3, 1947, at the age of 92. More information about Captain John Reynolds Hughes is available on the official website of the Texas State Cemetary, where he is buried, as well as from the Texas Ranger Hall of Fame and Museum.